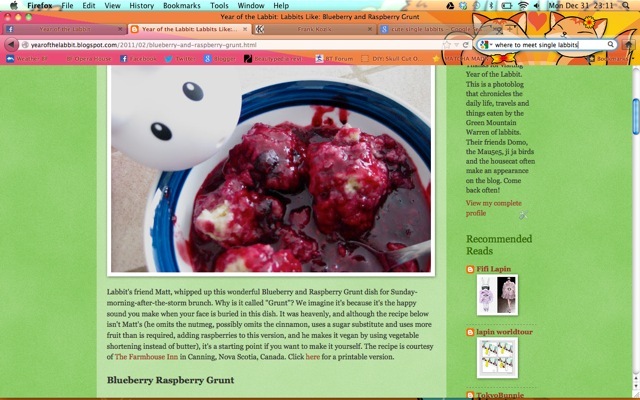 Year of the Labbit: FAQ #2 - Can I Print Your Recipes? Fans asked, and the labbits answered! Gayle asked, "Can I print out your recipes without all the pictures?" Well, the labbits can't believe you want to skip all the cuteness, but they realize that it's easier to read a recipe when you're not distracted by images sprinkled throughout the directions. 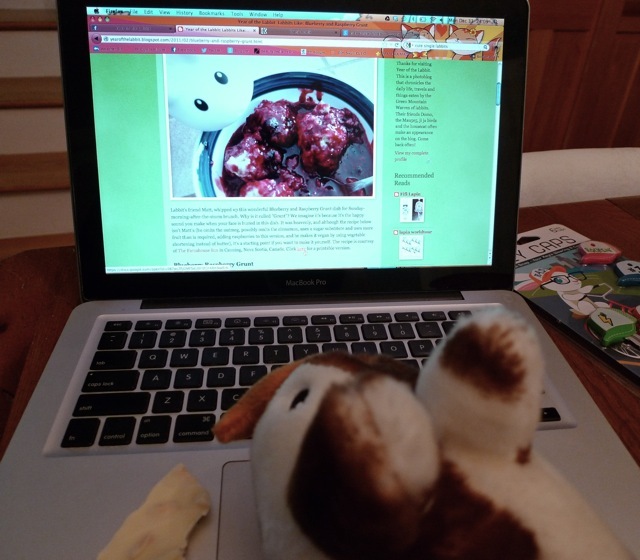 The labbits cook with the laptop in the kitchen all the time, and that makes for a really gross laptop. (What do you mean, "just clean it more often"? You probably think Patrick shouldn't leave his almond bark on the laptop, either.) Makes sense to print out the recipe and put it in a book. A labbit's cookbook, now wouldn't that be awesome? Patrick here has been busy the last few days making a major update to the blog. It's tough typing with big, furry paws. The dang keys are so small and it's a lot of hopping back and forth over the keyboard. Anyway, he likes to clean things up and start a new year fresh, so he's happy to announce the change has been made right before 2013! Now he can leave the laptop behind and ring in the new year with the other labbits. Here's Patrick's screenshot. Links to printable recipes, hooray! As you can see from Patrick's screenshot, each recipe will have a link you can click on that will take you to a printable .pdf file of the recipe. Most are only a page, but some of the more complicated recipes will be 2 pages. He did his best! Just click on the link, and you can print, share the link, and cook up a storm. The labbits wish you all a Happy, Merry New Year. 2012 was a great year, and 2013 is going to be even better!